It's Buffalo Wings N' Things National Chicken Fingers Day tomorrow, January 30, 2018. 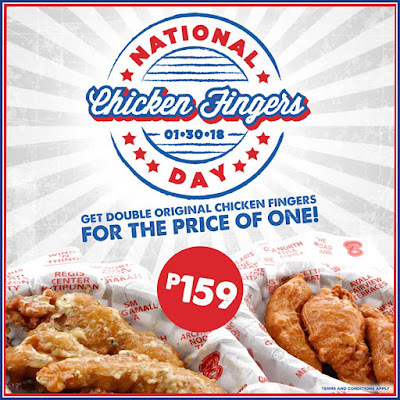 Get double original Chicken Fingers for the price of ONE - only P159! • Promo offer is available in all Buffalo's Wings N' Things stores nationwide. • Get your Double Original Chicken Fingers for the price of Single Original Chicken Fingers. • Maximum of 1 Double Original Chicken Fingers redemption per person per visit. • Valid for dine-in only, and cannot be combined with any other promos, discounts and set menu offers. • Prices may vary in provincial branches.